Charts A231 and A232 printed each side of a sheet. On this 2013 edition, a new plan of Benner Bay (St Thomas) replaces the plan of Virgin Gorda Yacht Harbour (which remains on chart A232). Harbour developments are shown at Road Harbour, and the latest known depths have been applied throughout. 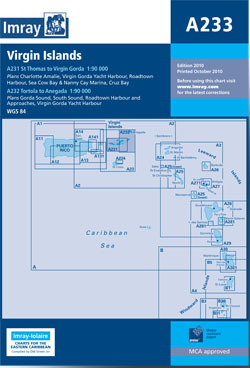 For this 2013 edition, the plan of Gorda Sound (Virgin Gorda) has been reschemed - the new version has been drawn at a larger-scale of Scale: 1 : 25.000 to show passages more clearly, and to show various marina developments, the plan of Road Harbour and Approaches has been divided into two plans - one of Road Harbour, and one of Fat Hogs Bay and Maya Cove, and the latest known depths have been applied throughout. PLEASE NOTE There are no sailing directions on this double-sided chart.